Is there a bug with the Topic It application? Hi guys, I have never activated the Topic It module on my forum, all items in the ACP were always set to No and our registration requires some mandatory questions to be answered to be able to complete the registration proces! But yesterday I received a new registration notification and by checking it in the inactivated users list I saw that not a single question was answered, so I wondered how is this possible? Fortunately it was a person I knew from Facebook, so I asked her how it was possible that she completed the registration proces whitout answering a single question.. she told me she saw the Topic It app, downloaded that and connected to the forum with that, she didn't see any questions and she didn't even had to create a password to get in! And while normaly inactivated users can't login until they are activated she was able to connect with the Topic It app through her FB account and that way connect to her inactive account on our forum to see what questions were needed to be answered.. So I checked the setting on the Topic It module again and saw that the module still wasn't activated, but the 2 last options were reset, the signature was set back to yes and I cannot change it to no anymore!! Also the banner appearance was set back to display for members and guests, that one could be changed back to no display.. I asked my other admin if she changed it in the ACP, but that was not the case !! So my question is if the techs did some updates on the Topic It application which made this reset in the ACP possible? How is it possible to connect with a forum through Topic It while the module isn't activated ? As you can see in below picture the module isn't activated, I didn't made an account on Topic It therefor I don't have an API key inserted, nothing of that all !! And I also want to point out that we're not able anymore to disable the Topic It signature, it just can't be set to no!! Re: Is there a bug with the Topic It application? This is pretty weird. The signature option works for me though, I can activate/deactivate it. Members shouldn't be able to connect or register on your forum with topic it anymore, though I haven't used the app yet so I can't guarantee. There is NO report of any bugs with the topic it app system. 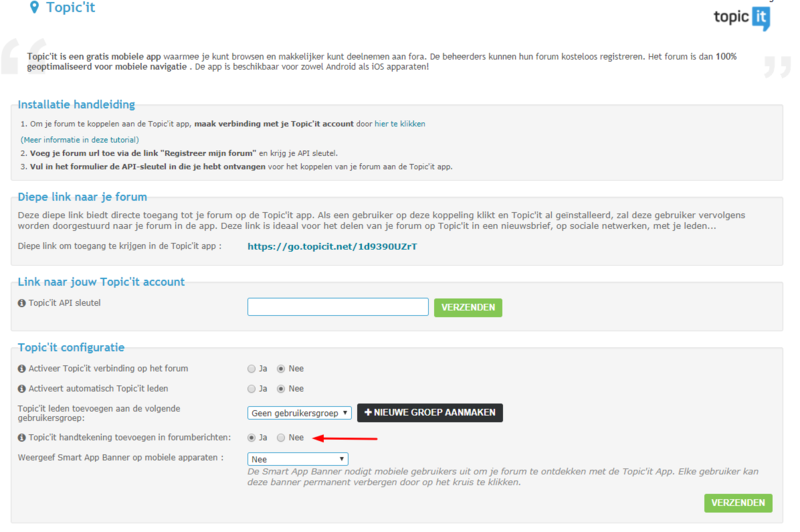 when a member makes an account on topic it the account is auto activated unless you turn it off in your ACP. What you should do is clear your browser and then log back in as founder. then turn it all on in your ACP and then save. This should tell our servers to clear the settings on your ACP and this should then fix your problem. sometimes it can take our servers time to make up it's mind and sometimes things can run slow. If you still have a problem then I can make a report to our head office for some more help on this matter.